Having Fashion Cents is not just about knowing how to shop, but it's also about knowing when to stop shopping and start revamping the awesome pieces that are already in your closet. Alexis' fashion skills were put to the test when she committed to wearing the same dress for 11 consecutive days. The goal was to see how creative she could get with a basic grey dress she purchased at Rue21 on sale for just $5. The rest of the items and accessories were things she already had in her closet. Pictured here are three different looks (from left to right): grunge, fall, and plain. 1. The first look includes a beaded flower belt from WetSeal, an old grey cardigan, and her versatile black studded loafers. 2. The second look screams fall with the floral denim jacket gifted from American Eagle and Alexis' signature tan boots. 3. The third look is self explanatory. Just plain and simple, shoeless & all. Pictured here are three very diverse looks (from left to right): business casual, fairytale fall, and flowy over-shirt. 4. Alexis is wearing a long sleeve blue button up that she purchased for $1 at a thrift store underneath her dress to add a professional dynamic. Her belt was $1 at CottonOn and her black bootie wedges were $6 at Goodwill. She wore this outfit to a business dinner. 5. Alexis named this look 'fairytale fall' because she fashions a Peter Pan collar underneath her shirt and pairs it with a cardigan for a cool fall day. 6. Alexis wore a flowy sleeveless blouse atop the dress and cinched it in at the waist with a belt that offered a pop of color. Three more looks are added to the book featuring (from left to right): a knit sweater frenzy, rustic punk, and galaxy gal. 7. Alexis purchased this oversized knit sweater at Salvation Army. Oversized tops work well over dresses. Sometimes a belt can be added so the sweater doesn't swallow you up. Her boots were purchased at Goodwill. 8. Vests are always a great dynamic to spice up a dress. This studded denim vest was purchased for only $6 at Rue21. 9. Leggings are a must when it comes to versatility! They permit women to do more activities when wearing dresses, and in this case, they make Alexis seem 'out of this world'. These galaxy print leggings are a must-have. Alexis won hers in an eBay auction for only $2. The finale of looks (from left to right): army hipster, and sparkled swag. 10. Alexis wore an oversized sweater over the dress to add a comfortable dynamic. The sweater was only $6 at Plato's Closet. She paired this with a black straw fedora that was $1 at CottonOn and her favorite black combat boots. (This look is Alexis' favorite.) 11. A beaded crop top added a fresh twist to this simple look. The beaded shirt was found at a local Goodwill. Now, the challenge is yours! Pick a dress -- any dress -- and style it different ways using Alexis' techniques. What's amazing is that no one noticed Alexis' was wearing the same dress every day, except the people she told. Change up your shoes, add a hat, wear something over or under it. The possibilities are endless. 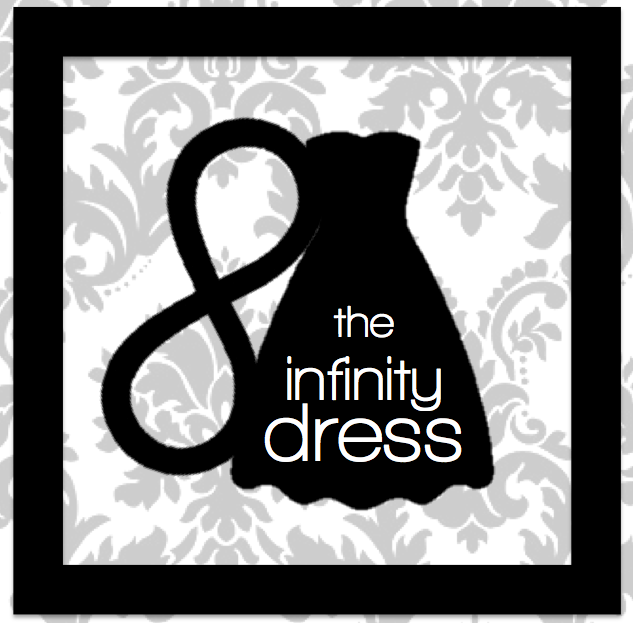 Create your own infinity dress.